Common Clownfish can grow up to approximately 11 cm in length. The body of the fish is bright orange, with three thick white stripes distributed vertically across the body. These white stripes are accompanied by thin black stripes which separate the white and orange coloring. Each of the fins also features a thin black outline. Additionally, the Common Clownfish has between 10-11 dorsal spines, as well as 13-17 dorsal soft rays. These clownfish are found in the Indo-Pacific Ocean, specifically in the regions between Thailand, Northwest Australia, Singapore and Taiwan. Clownfish are the only species of fish that live among the tentacles of sea anemones—other fish would be stung by the anemone, but clownfish secrete a mucus over their entire bodies that makes the anemone think it is in contact with itself and therefore prevents it from stinging. This is a symbiotic relationship between the anemones and the clownfish, as the fish are protected from predators, and the anemone is maintained by the clownfish, which keeps it parasite-free and well-fed. Anemones that provide homes for clownfish are typically found in warm, shallow waters, and clam lagoon areas. Unlike other jellies, comb jellies lack stinging cells. They are in a different phylum than the rest of the jellies. They are called Ctenophores because they are from the phylum Ctenophora. 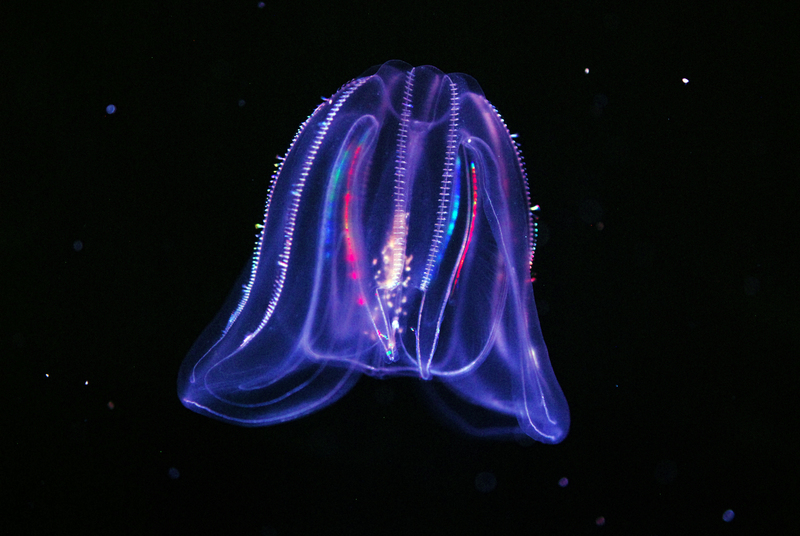 Comb jellies have oval shaped bodies with tiny rows of comblike plates running down the sides. As they swim, these plates diffract (bend) light to produce a shimmering, rainbow effect. Comb jellies can be found on the Connecticut shore, but are considered an invasive species in other parts of the world. Invasive species are a serious problem because they can disturb the balance of an ecosystem. They only grow to 3-5 inches long and 1 inch in diameter but they commonly eat prey that is larger than they are. They use special structures in their mouths to bite off chunks at a time. Some can expand their stomachs to hold prey that is half their size. Comb jellies are also referred to as sea walnuts. Seahorses are members of the Syngnathidae family, which also includes pipefishes, pipehorses, and seadragons. Seahorses are easily recognized by their horse like head that lays perpendicular to the body and long, curling prehensile tail. A seahorse’s body is covered by a series of bony rings and boneless fins. Movement is controlled by rapid pulsation of the boneless dorsal fin and small pectoral fins. Lined seahorses can vary in color, ranging from orange and red to brown and black; these colors can change to blend with their environment. Considered to be a larger seahorse species, they can reach an average size of 5 inches in length, but a young seahorse is about 5/8 inch. All seahorses are marine (found in the sea or ocean), living among eel grass, seaweed, mangrove roots, and corals along tropical and temperate shorelines around the world. They are typically found in shallow water where vegetation is abundant. They can be found in shallow coastal regions from Cape Cod, MA to Argentina. An adult moon jelly is commonly identified by the appearance of 4 horseshoe shaped reproductive organs which are visible through their clear bell. 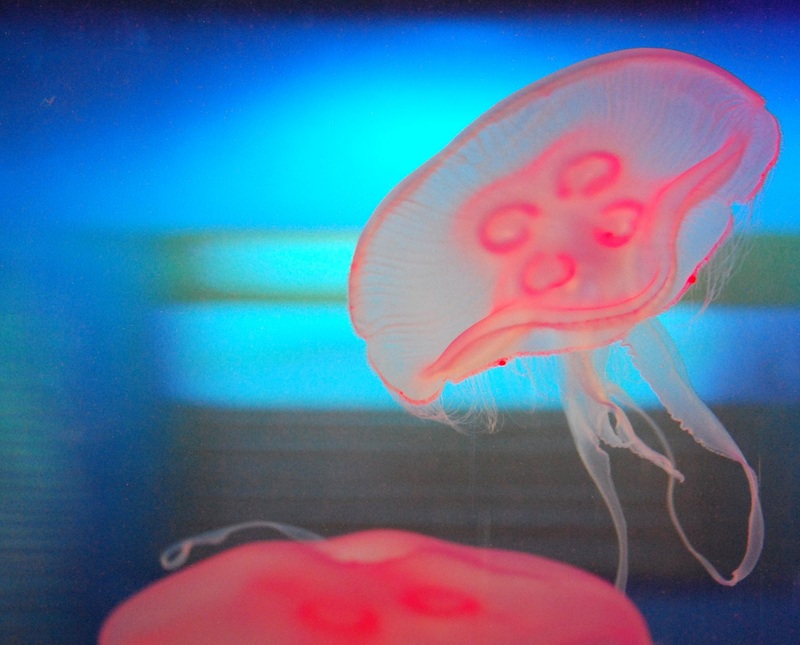 The reproductive organs of the animal are located near the bottom of the stomach so when the jelly feeds the area around the gonads will take on the color of the prey. Moon jellies have small tentacles lining the bell and distinctive oral arms, which assist in feeding, draping from the center of the bell. 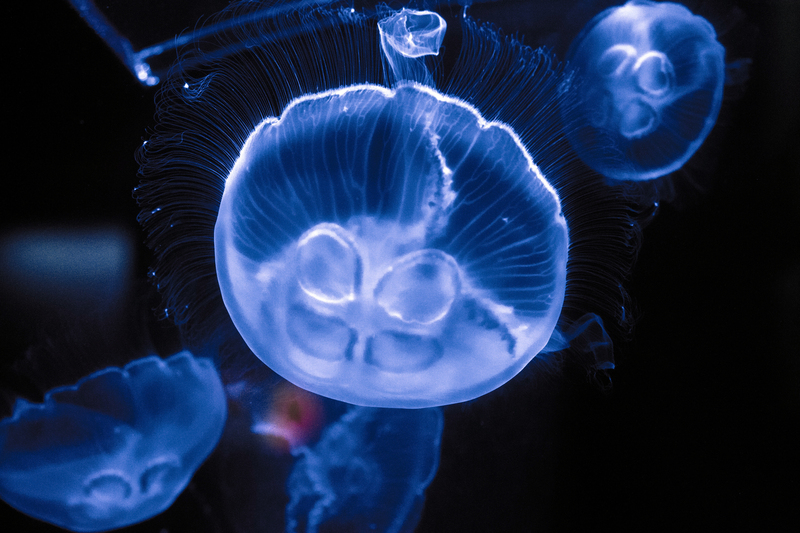 Jellies are found in water with temperatures ranging from 48ْ -66 F (but can withstand water temperatures between 21 – 88 F). These amazing invertebrates can even live in brackish water (a mixture of fresh and salt water); however, the bell will take on a flattened appearance when in areas of low salt concentrations.